Consolidate all of your ornament boxes into one! 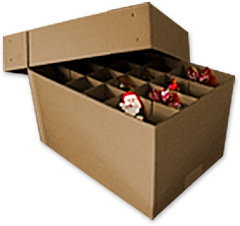 This box is a great storage solution for your ornaments after the season is over. With 24 slots per tier, you can put 72 ornaments in this box! Partitions can also be removed to store your longer or more elaborate ornaments. The Ornament Box is a 17" x 12 x 9" Half Slotted Carton with 3 layers of partitions, separated by a sheet of fiber board.